Named for their bell-like shape, bell peppers are actually a fruit in the same family with tomatoes, potatoes and eggplant. For gardeners, peak season is summer, but bell peppers are available year-round in the produce department of any supermarket. Our recipe for Grilled Summer Fresh Peppers shows them off in all their summer glory. During fall and winter, when it’s chilly outside, it’s chili time inside, and many of our chili recipes call for a bell pepper or two. Another place where bell peppers pop up with amazing frequency: stir-fry recipes and pasta recipes—and no wonder. They add color, flavor and vitamin C to any dish lucky enough to list them as an ingredient. 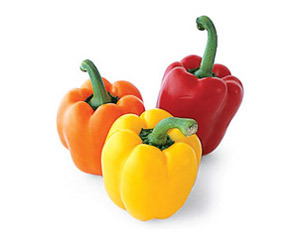 Bell peppers come in a variety of colors, including green, red, yellow, orange, purple, white and brown. Their sweet, mild flavor and crisp, juicy flesh make them a cooking staple. Bell peppers can be stuffed and baked, grilled, roasted, stir-fried and served in salads, stews and soups. Green peppers, the most common and least expensive variety of bell pepper, are picked before they ripen and have a slightly sharper flavor. When left to ripen, green peppers become sweeter and turn red, yellow or other colors depending on the variety. Select firm, crisp bell peppers that feel heavy for their size. They should be shiny and richly colored. Avoid any that are shriveled or have soft spots. For stuffed peppers, choose round, blocky-shaped peppers. Refrigerate unwashed peppers in a plastic bag for up to 1 week. Red, yellow and other colored peppers are slightly more perishable than green peppers. Wrap leftover cut peppers in plastic wrap and refrigerate for 1 to 2 days. Rinse bell peppers under cold running water just before using. To chop or slice, stand pepper on its end on a cutting board. Cut down 3 or 4 times to form vertical slices. Discard the stem, core and seeds. Remove the white veins or membranes. Cut the slices into strips or chop as desired. To cut pepper into rings or prepare for stuffing, make a circular cut around the top of pepper with a paring knife. Pull out and discard the stem, core and seeds. Carefully cut out the membrane and rinse with water to remove any seeds. Slice crosswise to form rings or leave intact for stuffing. Roasting peppers gives them an intensely sweet, smoky flavor. To roast peppers, arrange whole peppers on a foil-lined baking sheet. Broil 2 to 4 inches from heat source until blackened on all sides, turning with tongs as needed. Wrap peppers in foil from pan and place in plastic bag to steam and loosen skins. When cool enough to handle, peel off and discard blackened skins with a paring knife. Remove and discard stems, cores and seeds. Slice and use in sandwiches, salads, dips, spreads, pizza toppings and pasta dishes. Red peppers are an excellent source of both vitamins A and C.
Green peppers are an excellent source of vitamin C.
Cut peppers into strips and serve with your favorite dip for appetizers. Toss cut-up peppers into stir-fries, salads, chilis, soups and stews. Stuff hollowed-out bell peppers with cooked rice, pasta or other grains and bake for a hearty entrée. Serve your favorite creamy dip in a hollowed-out bell pepper for a unique, edible bowl. Top pizzas with raw or roasted, sliced or diced bell peppers. Add chopped or sliced peppers to pita pockets and wrap sandwiches for great color and crunch. Stir chopped red, yellow or orange peppers into fruit or vegetable salsas for a touch of color and sweetness.